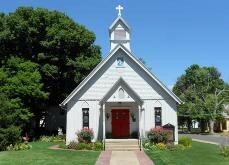 St. John's Episcopal Church - New to St. John's? Consider this website as a very large invitation to St. John's Episcopal Church in Mt. Vernon, Indiana. We invite you to explore everything we have presented on our website, but most importantly, we invite you to join us for worship on Sunday morning or for one of our parish events throughout the year. We realize that walking into the door of a new church on a Sunday morning can be intimidating. We want to take some of that anxiety away by helping you to know what to expect on your first visit with us. We want you to be more than just a visitor, we want you to be our invited guest. We want you to come and see. Come and worship. Come and serve. Come and play. Come and join us. To learn more about our worship and hospitality beyond what is listed below, please vist our Worship page. We rely solely on street parking around the church along Mulberry Street on the west side of the church and along Sixth Street on the south side. We have several elderly members that still drive to church on Sunday morning and we try to keep the spaces directly in front of the church open and available for them to park their cars. For larger church events, the grass lot across the street is used for parking. We are a typical Episcopal Church that has doors painted red. We have two main entrances that are primarily used on a Sunday morning. The front entrance is the double red doors located on Mulberry Street. Our Sunday morning Greeter is stationed at that door. However, other members enter through the rear (red) door of the parish hall that faces Sixth street. While we do not have a greeter stationed in the parish hall, if you arrive early enough, there are usually several people hanging out there before the service who will be glad to welcome you, help acquaint you with the church layout and direct you through the church to the main sanctuary (Nave). There are bathrooms located in the parish hall just inside the entrance door. For those entering through the parish hall, it is acceptable to enter the Nave by going through the hall and sacristy to enter through the rear of the church. Our trained Greeters are stationed either outside the front doors of the church, or just inside the door during inclement weather. We encourage our guests to inform the Greeter if they are familiar or unfamiliar with the Episcopal style of worship. However, the Greeter will probably ask you upon arrival. 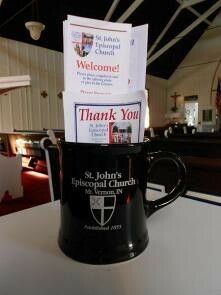 If you are already an Episcopalian or are familiar with our service, the Greeter, once they have welcomed you to St. John’s will present you with a bulletin that contains the hymns, Scripture readings, and announcements for that particular Sunday. We worship from the 1979 Book of Common Prayer and the 1982 Hymnal which are located in the pew bookracks. If you have never worshipped in an Episcopal Church before, do not let your heart be troubled. We have “Guest Worship Guides” that explain our service and walk a guest through the service, step-by-step. We can also seat you next to someone who will be more than willing to help you navigate through the service and help you enjoy your first experience of worshipping with us. As with any church, there are members who typically sit in the same general area or specific pew each Sunday, but we are friendly and accommodating, so feel free to sit anywhere you like. At some point during the service, either at the beginning or during the Exchange of Peace, you will be given a gift of a sturdy coffee mug with a Guest Information Card and various other pieces of handy literature. We also have a literature rack just inside the main entrance that features a number of pieces about the Anglican Church, the Episcopal Church and about our faith and beliefs in Jesus Christ. Feel free to peruse the rack yourself or ask the Greeter to help you make selections. We encourage you to fill out the Guest Information Card and let us know a little bit about your visit with us on this day. Our priest uses the information to provide a follow up “thank you”. Obviously, we hope that we go beyond being just a “friendly church” and make you feel welcome enough to want to come and worship with us again or join us for our many community service projects or fun fellowship gatherings. To learn more about our worship and ministry with children, please visit our Children's Ministry page. We are a relatively laid back congregation and accept just about any type of dress for our Sunday worship. On any given Sunday you might see people dressed in suits and dresses sitting in the same pew with other people wearing jeans and casual shirts. 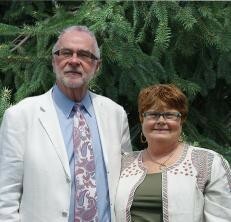 We tend to dress nicely for special occasions, such as Christmas and Easter. In the spring and fall we schedule a yard work day to take place after the Sunday morning service. On those two Sundays, those in the congregation who plan to work outside come dressed for worship in work jeans, tee shirts, and even work boots or grungier tennis shoes. We also occasionally hold services outdoors either at someone’s residence or at a local state park. When we have these outdoor services, we tend to dress more casually as well. In the heat of summer, it is not uncommon to see members of the congregation wearing shorts, and even our priest occasionally wears shorts under his liturgical vestments. So when you come, wear whatever feels comfortable to you and you will fit right in. Go to our Calendar webpage to see if there is anything special going on the Sunday you plan to come. 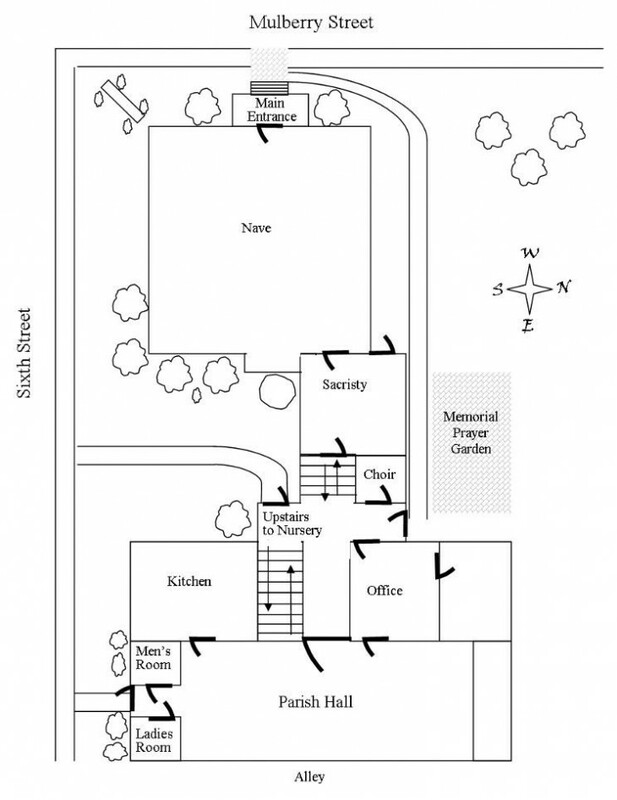 The map below gives you an idea of how our church and parish hall are connected and how to navigate your way around. We also have signs on many of the primarily accessed doors.